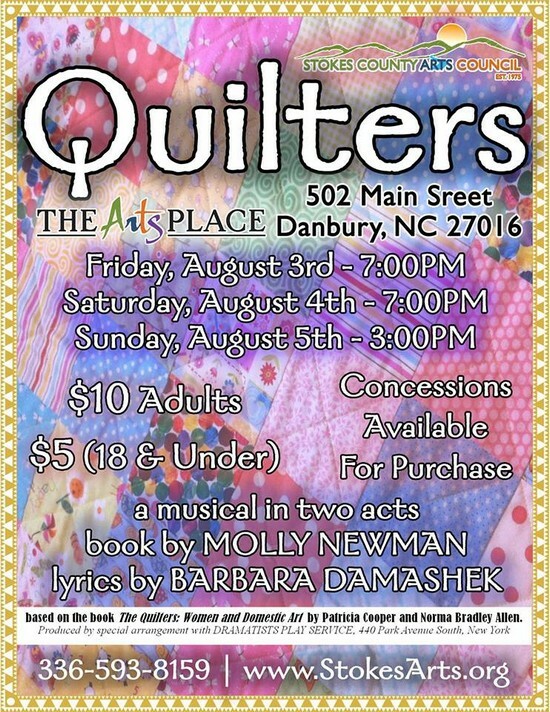 The Stokes County Arts Council and the NoneSuch Playmakers present "Quilters," a tender, moving play about a pioneer woman and her daughters, Quilters skillfully blends a series of interrelated scenes into a memorable musical. Each scene is introduced by a quilt square or “block” symbolic of life’s passages. During each “block”, the actresses skillfully transform into many different characters whose stories depict the lot of women on the prairie. Combining music, dance and drama, QUILTERS captures both the harsh challenges and the abiding rewards of frontier life with vivid dramatic intensity.